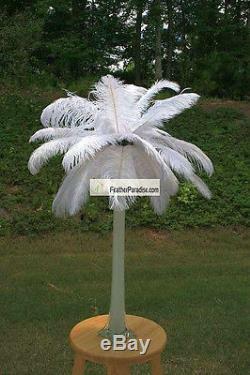 Each set of beautiful elegant ostrich feather centerpiece includes the following items. 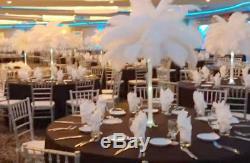 2 dozens (24 pieces) 12"-14" White ostrich feathers (drabs). 1 Piece 24 white(or black/clear) color Eiffel tower vase. 1 Pieces green floral stem/holder. Sample Design Shown in Picture. C olor: 20 colors available, white, red, yellow , Gold, turquoise, blue, purple, green, orange , hot pink, brown, black, mint green, light blue, lime green, candy pink, fushia.. Pack: 6 sets included in one order. Please tell us which color feathers and vases you want. The item "White Ostrich Feather Centerpieces Wedding Table Centerpieces 6 Sets (GA, USA)" is in sale since Wednesday, November 26, 2014. This item is in the category "Home & Garden\Wedding Supplies\Centerpieces & Table Décor". The seller is "frontierview" and is located in Alpharetta, Georgia. This item can be shipped to United States.